Prominent players accounting for a major share in the global food ingredients sterilization market are Balchem Inc., Wenda Ingredients, Croll Reynolds Inc., Sterigenics International LLC, Croll Reynolds, and Safe Spice, finds Transparency Market Research (TMR). Some of the top companies in this market already provide specialized offerings in the healthcare sector and specialty chemical products to the food and beverages industry. Leading players have a stronghold in the food and beverages industry; however, owing to their technical expertise in sterilization, they have gained a competitive advantage in the food ingredients sterilization market, observes TMR. Several players are offering value-added products using basic ingredients to consolidate their shares. 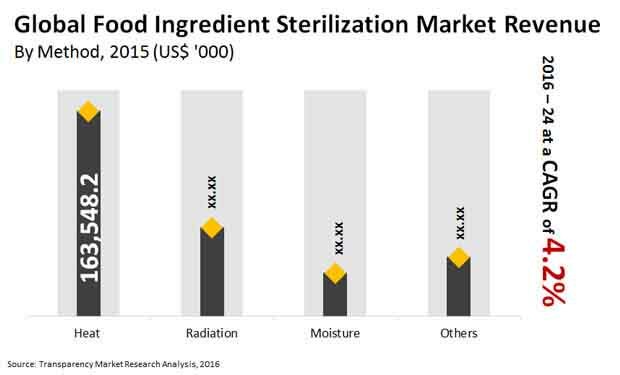 Expanding at a CAGR of 4.2% from 2016 to 2024, the global food ingredient sterilization market is anticipated to reach US$452,046.9 by the end of forecast period. The estimated valuation of the market at the end of 2016 was US$326,069. Based on geography, the major regional markets for food ingredients sterilization are Europe, North America, Asia Pacific, the Middle East & Africa (MEA), and Latin America. Of these, currently, a major chunk of the demand for food sterilization comes from countries in Europe and North America. However, in the coming years, the Asia Pacific market is expected to rise at a strong CAGR over the forecast period. The impressive growth of the regional market is attributed to the swift pace of urbanization in emerging nations and the growing demand for convenience foods across the region. The major methods of food sterilization are heat, radiation, and moisture. Among these, the heat sterilization method leads the market. The substantial demand for sterilization using moist or dry heat or by using indirect heating methods is due to their enhanced efficacy in extending the shelf life of food ingredients. This method is especially helpful in killing bacterial endospores and microorganisms. Undercooking, contamination, and incorrect food processing are leading causes of food poisoning worldwide. This has also led to a rise in food recalls, adversely affecting the reputation and profit margins of manufacturers and vendors. As a result, there is an accelerating demand for various food sterilization methods to make them safe for consumption. In addition, the use of sterilization methods in food processing also increases the shelf life of the products. These are the key factors propelling the food ingredients sterilization market. Furthermore, the process of food ingredient sterilization significantly reduces the use of food processing agents and limits the use of preservatives, which is a major concern among consumers. This, therefore, boosts the market. Sterilized foods minimize the risk of carrying food-borne pathogens, significantly reducing the instances of food poisoning. However, limited consumer awareness related to food sterilization methods and the faulty use of sterilization equipment are likely to hinder the market to an extent. Nevertheless, advancements in techniques to process food and the advent of high hydrostatic pressure in combination with temperature (HPT) technique are expected to unlock exciting opportunities for market players. Advanced sterilization methods aimed at reducing the pathogen count in ready-to-eat and packaged foods are encouraging developments in the market and this is expected to open up lucrative avenues.